The Oregon Department of Human Services maintains a website to help families pick safe senior living facilities for their loved ones, but intentionally omitted 8,000 substantiated complaints at care centers including cases of seniors being punched, slapped, pushed, and sexually abused. Over 60 percent of complaints against Oregon care centers are nowhere to be found on the department’s consumer advocacy website, putting thousands of Oregon’s most vulnerable citizens in harm’s way. Oregon officials have concealed from the public thousands of confirmed cases of shoddy care and elder abuse, whitewashing safety records at hundreds of homes for seniors across the state. The Department of Human Services operates a website that is supposed to help consumers identify safe havens for their aging loved ones, including those suffering from Alzheimer’s and other debilitating illnesses. But an investigation by The Oregonian/OregonLive found that officials have excluded nearly 8,000 substantiated complaints of substandard care from the state’s website. The newsroom spent months analyzing state records that aren’t available online, compiling for the first time a full accounting of substantiated complaints at Oregon care centers. Reporters wrote computer code to download every online complaint from the website and used the data to identify thousands of missing records. More than 60 percent of the substantiated complaints against care centers in Oregon since 2005 can’t be found on the state’s website. The excluded complaints, all validated by the department’s own employees, show cases of elderly residents being punched, pushed, slapped or sexually abused by staff. Other missing complaints describe residents who had valuables stolen or who landed in the emergency room after getting the wrong medication. 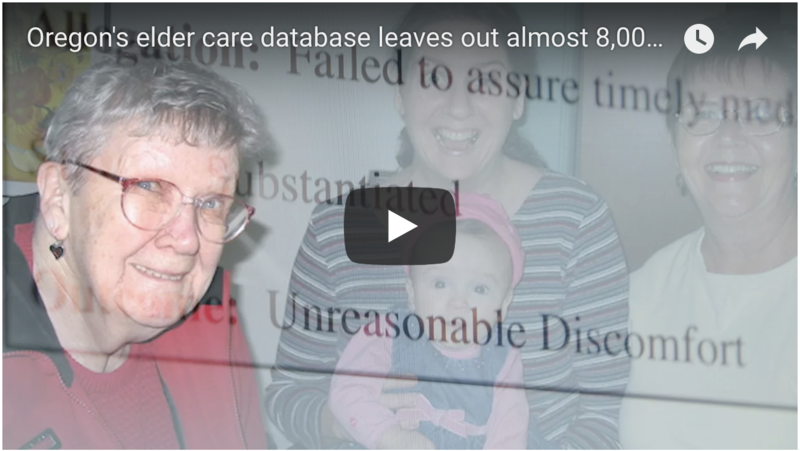 The omissions skew the track records of nine out of every 10 senior care centers in the state. “It’s a mess,” said Ashley Carson Cottingham, who inherited the website when she became director of Aging and People with Disabilities program in December 2015. Most of the omissions are intentional, part of a departmental policy adopted years ago to withhold certain types of information from the public, officials said. Others are due to mistakes in the way state workers classify complaints. “There is inconsistency all over the place,” Carson Cottingham said. The agency intends to replace the website and post all new validated complaints online in the future, a spokesman said. But a replacement could be years away because the department has decided to tackle other software projects first. Sue Crawford learned the hard way that the state’s consumer website can’t be trusted. With her 93-year-old mother, Marian Ewins, battling dementia, Crawford spent two weeks dutifully touring care centers, interviewing staff and zeroing in on a new place near her home. She went to her computer and checked the state’s consumer website for Washington Gardens Memory Care in Tigard. No complaints of abuse, neglect or shoddy care had arisen in the entire three-and-a-half years the home had been open. But the state website did not reveal the 10 times that Washington Gardens had been hit with substantiated findings of abuse, neglect or poor care.